In this post I will share some of the insights I got when tuning Hadoop/Mahout on Amazon EC regular and high performance nodes. I was using two algorithms. 1) Mahout's Alternating least squares application (See MAHOUT-542) with Netflix data. (Sparse matrix with 100,000,000 non zeros). Test was done with up to 64 HPC nodes (512 cores). 2) CoEM algorithm - NLP algorithm (R. Jones, 2005) with data graph of around 200,000,000 edges. Below are running time results for running one iteration of alternating least squares (implemented by Sebastian Schelter) on Netflix data. Runtime is in seconds. X-axis are the participating machines - from 4 to 64 machines. My conclusion from this experiment, is that 16 HPC nodes (256 cores) are enough for computing matrix factorization/CoEM of this scale. Beyond 16 nodes there is no benefit in further parallism. Below I explain how I fine-tuned performance. Preliminaries: I assume you followed the instruction on part 1 of this tutorial to setup Hadoop on EC2. - I set dfs replication to 1. Replication determines the number of copies the hdfs data is saved on. When working with a relative low number of nodes (several) higher replication delays performance. You should set all those directories to point to DIFFERENT paths which have ENOUGH DISK SPACE. And then created /home/data/tmp1 /home/data/tmp2 /home/data/tmp3 and pointed the above fields to there. The default is 64MB. For CoEM set it to 4MB, so there will be enough mappers for all cores. For Netflix data I set it to 16MB. When the block size is too small, there are too manny mappers, resulting in loading the system, having many task failures, and some of the job trackers gets black-listed. Having too few mappers does not exploit well parallism. Unfortunately it seems that block size should be tuned separately for each algorithm. 2) The file core-site.xml should be configured as explained in the first part of this post. 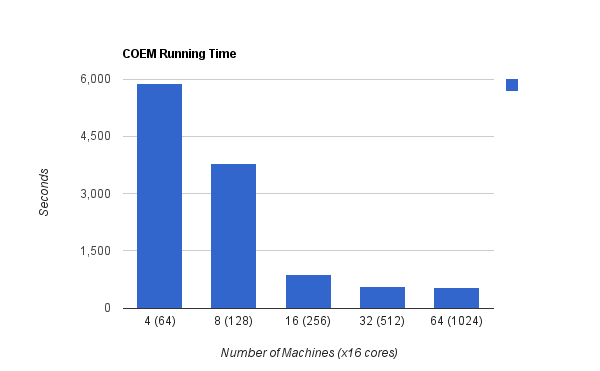 empirically setting them to the number of cores -1 seemed to work the best. (On HPC nodes, 15 cores). Note that this number is per machine. Common practice says to set it to 0.95 * number of machines * (number of cores-1). For me that did not work well, especially with 64 machines - reduce phase becomes terribly slow with very slow copying phase (in Kb instead of MB). Finally I set it to 64 for all experiments. set them to the values above. Note that it seems that reduce tasks maximum is a global maximum and not a limit per single machines. So in this case 64 was a global limit of 64 reduce tasks. don't ask me what is the difference to previous field - probably a bug. Anyway I set it as well. significantly the disk writes to about 1/3 the size. set it to -Xmx2500Mb , the default is 500, which results in out of memory errors, java heap errors and GC errors. out of memory error and out of heap size erros. Java string parsing is rather slow. Avoid reading string input files as possible and write the data in binary format whenever possible. For the CoEM algorithm, avoiding string parsing resulted in x4 faster code, since the inputs files where read on each iteration. Block size and controlling the number of mappers. I believe someone already commented on this. In general, you want to have the block sizes relatively large in order to induce your job to perform sequential instead of random I/O. You can use the "InputFormat" to control how the work is split and how many tasks are created. I've found that the first instincts users have is to match the number of mappers or reducers per node to the number of cores. For many Hadoop applications, this does not work. Properly setting these parameters is application dependent (module the available resources). 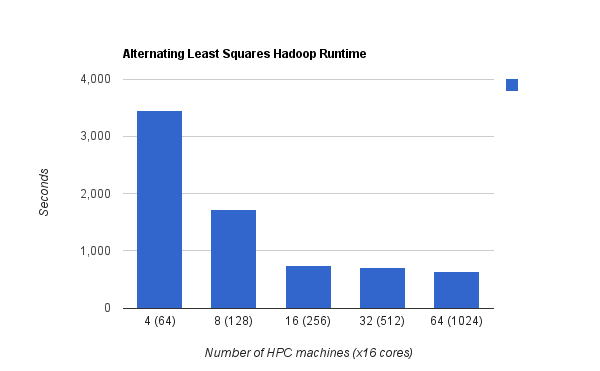 In Hadoop these are framework-wide parameters. In my experience, how memory is allocated to tasks has a much larger impact on application performance. However, it is not clear how these memory parameters should be set, and there are all sorts of complex interactions among tasks. For reference, in the cloud cluster, there are 8 cores per node, we allow 10 simultaneous tasks to execute per node and in general we see better throughput that way. As I mentioned earlier, most jobs experience contention for memory. When stopping and starting Hadoop you should be very careful since Hadoop generates a zillion of temp file, that if found on the next run makes a mess. Since if the file system was formatted the script will get stuck without getting the "Y" input. 2) Remove all /tmp/*.pid files, or else Hadoop will think some old processes are running. especially VERSION files. Old VERSION files lead to namespaceID collisions. There are other ways to tune the number of mappers. Typically it is good to leave the block size relatively large and set mappers by other mechanisms such as min split size. Thanks for the tip. I will take a look on how it can be done! Thanks! I've fixed the typos.